Ref No Grave or Memorial / Rhif cyfeirnod bedd: XXIX. F. 12. Archie Roberts was born about 1894. He was recorded living with his family in the census of 1901. They were at The Boathouse, Broughton, Brymbo Nr Wrexham. Head of the household was Phillip Roberts, a 35 year old Hewer of coal. His wife, Sarah Ann was 35 and she did ‘Housework’. Their listed children were Minnie 7, Archibald 7, Gertrude 4, Harold 2. Also listed on census night was a brother John Jones. He was 33. The next census of 1911 recorded the family at 2 Chapel Terrace Ffith, Flintshire. Head of the household, Philip Albert Roberts was listed as a Widower aged 45 and still a hewer of coal. The children in the house were Archibald Norman a 17 year old Quarryman. Gertude was 14 and Harold was 13. 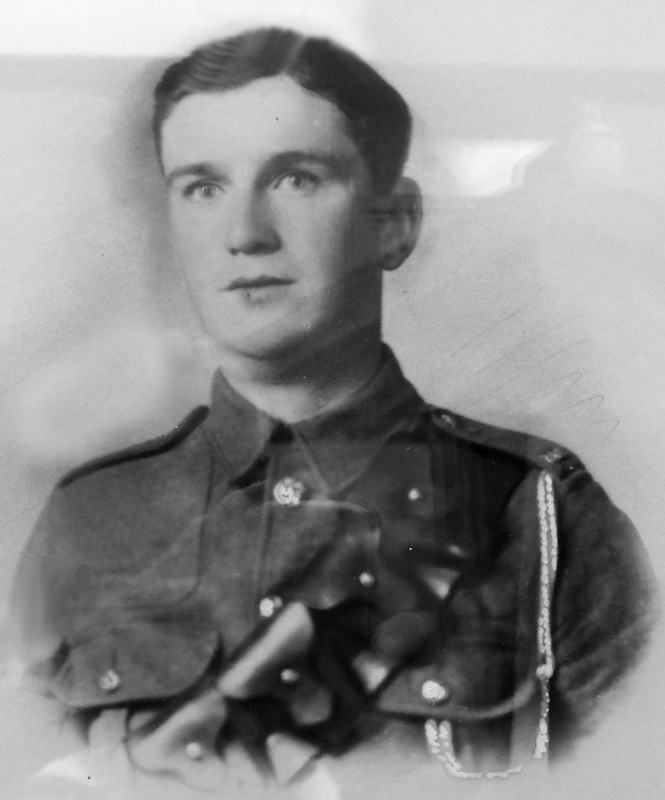 Archie’sArmy Service Records have survived and are accessible on www.ancestry.co.uk. The records tell us that he signed up on 23rd August 1914 in Wrexham. His attestation papers say that he was 20 years and 6 months old and his trade was ‘plasterer’. The papers include a description of him. He was 5 feet 9 and a quarter inches tall, weighed 132 lbs, had a fresh complexion and blue eyes and light brown hair. He had a small scar on the right side of his lower waist. The medical officer declared him fit for service in the Dragoon Corps. Archie named his father, Phillip Roberts of 2 High Street, Ffrith as his next of kin. Archie said that he was Cof E.
Six days after enlisting. Archie found himself in Canterbury, presumably for training. He got himself into a spot of bother in Canterbury in January 1915. He went absent off pass for 24 hours and was confined to barracks for 3 days and lost two days pay. The witness to this ‘crime’ was one Sgt Twig. Archie served throughout the war from the 23rd August 1914 but the records don’t tell us where he served during those years. We know, however, that he died in France in April 1918. He died in 46 Staty Hospital in Etaples. There is a handwritten note by a medical officer who said he died of Pyaemia on the 19th April 1918. (Pyaemia is a type of abscess forming septisaemia) The M.O. added that “Death was due to exposure while on military duty”. 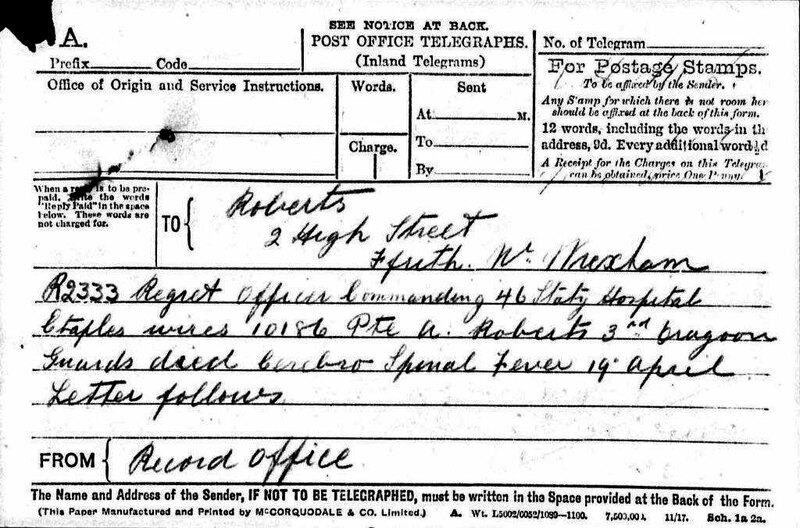 The records contain a copy of the telegram that was sent from the hospital to the war office on 19th April 1918 which says Pte A Roberts 10186 died of Cerebro Spinal Fever. There is also a copy of the telegram that was sent to Archie’s father informing him of his son’s death. The father actually received a pension from the army of 9/- per week. There is correspondence in the records between the army and Phillip Roberts concerning the receipt of his three medals, his personal possessions and a commemorative plaque and scroll. Phillip Roberts was asked to provide details of all Archie’s living relatives as on 1st September 1919. He listed himself as Father of the soldier and gave his address as Avon Dale, Ffrith. There was no mention of mother. Full blood sister Gertie Roberts 22 South View Old Town Lane, Freshfield and half blood sister Helen Roberts aged 4 of Avondale Ffrith.